Mother Mary serves on the fifth ray, the ray of healing, abundance, vision and truth. The vibration of this ray appears as the color emerald-green. So Mary, the Mother of Jesus, is from the angelic realm. She is a being of great power and authority and the perfect choice for the role of the Mother of a World Saviour. She and her twin flame, Raphael, have their retreat over Fatima, Portugal. When we are in need of healing, if we desire to shine the light of truth on any situation, if we are wanting financial abundance for our families and to serve others or want to enhance our ability to hold a strong, positive vision for a personal project or the future of this planet, Mary and Raphael are the names to have on our lips and in our hearts. In the West, Mary has held a similar role for the Christian world as the feminine goddesses of Hinduism have held for devotees in India, as Kuan Yin, the merciful-hearted bodhisattva has held for the Chinese Buddhist. Mother Mary is worshiped as the Mother of God, as a Savioress among Christian Catholics. Who is this feminine icon, loved and worshiped by millions of devotees? Each soul has a story to tell that spans eons of time. We are what we are today because of choices made yesterday and throughout the yesteryears. Many millennia ago, we emerged, issues of our Father/ Mother in heaven, created equal in every way. Some to whom we look for guidance today, like Jesus, Mother Mary, Saint Joseph, and other saints and initiators of religious movements have simply made more selfless choices, allowing them to now be of world service, assisting us to become like them, like our Father in heaven. We owe these beings, now ascended, immeasurable gratitude. The soul of Jesus, through lifetimes of surrender to God’s will, prepared for his final and glorious embodiment as our Savior. And the soul of Mother Mary also prepared herself in the same way to play her role as Jesus’ Mother in her final embodiment 2000 years ago. The ascended masters teach that there are 3 kingdoms—the sons and daughters of God, the angelic kingdom and the elemental kingdom, meaning the beings of nature such as gnomes, undines, fairies, sylphs, salamanders. Mother Mary is of the angelic kingdom. She is an archeia, a feminine archangel. Her twin flame is Archangel Raphael, and they serve together today on the green ray of healing and truth. In addition, the ascended masters have told us through their messengers that the soul of Mary had served in the early days of Atlantis as a temple virgin, a priestess even then on the same emerald ray. In her rounds of incarnations, she had become so one with the Cosmic Virgin because Mary had fine-tuned her ability to hold the immaculate concept for all souls and situations. She was able to see only perfection in each individual, each circumstance. Among her preparatory embodiments, she had been mother to Jesus’ soul on at least one other occasion. As the wife of Jesse, recorded in the Old Testament, she gave birth to eight sons, one of whom was David, an embodiment of Jesus. David was a shepherd boy who adored his heavenly Father through songs of praise as he tended sheep on the hillsides. Later in that lifetime, he was anointed by the prophet Samuel as the king of Israel. This lifetime wasn’t so much a karmic repetition of their relationship as mother and son, as many of us experience within our family relationships, but more like a practice run for the time when their two magnificent souls would work together with the soul of Saint Joseph to impact the world so profoundly that a new religion would be created, a calendar would be divided in two and from that time on, Jesus, Mary and Joseph would be referred to as “the Holy Family.”. In her final embodiment as Mary the Mother of Jesus, her parents, Anna and Joachim, initiates of the Great White Brotherhood, dedicated her to God at her birth. And as was said of John the Baptist, Mary was filled with the Holy Ghost from her mother’s womb. At three years of age, Mary was taken to serve in the temple once again, this time in Jerusalem. It is said that when Anna and Joachim brought her there, they placed her on the first of fifteen temple steps, symbolic of certain initiations, and little Mary climbed the steps with ease, demonstrating her preparation for the mission that lay ahead as the mother of Jesus in this lifetime. As a temple virgin from ages three through fourteen, Mary enjoyed communion with the angels and great protection from them. She spent her time in contemplation and the holding of all of the earth in her immaculate vision. Day by day she became the spirit of humility and beauty that shone like the sun from her being. At age fourteen, when the temple virgins were to be given in marriage, Mary requested that the rest of her life be dedicated only to temple work. But God had other plans, as we know, and she was betrothed to Joseph, who was himself a rather reluctant player in this drama of the ages. Considerably older than Mary, he was taken by surprise at being chosen as her husband. And it was not until an undeniable sign from heaven—a dove descending upon Joseph’s staff—that he surrendered to the will of God, taking Mary to be his wife. 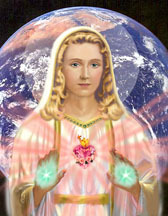 The teachings of the ascended masters emphasize the desire of both Mary and Jesus that they not be worshipped. Instead, Mary desires that those who look up to her and Jesus be themselves examples of holy living and service to mankind. For all are meant to walk and talk with God, to become a Christ, a Buddha. Divine potential lives in each child of God. Below is an example of lyrics adapted from prayer 50.016 and set to a lovely melody. And now it has been made into a video with soundtrack of that original song. Mother Mary comes to tell us that holiness is the need of each soul. If we are to return to God, we must no longer think that we are sinners but that we are joint heirs with Christ. She reminds us that Jesus did not come simply to be worshiped, but that he sought to teach mankind the way whereby they could ascend back to the heart of God. She says every soul is made in the image and likeness of God. And therefore, each of us is pure in the eyes of God. No one is a sinner! With Jesus, she asks us not to grovel upon the ground but to stand forth as sons and daughters of God, proclaiming the glory of the Son of God within us! Mother Mary serves on the fifth ray, the ray of healing, abundance, vision and truth. Mother Mary is a cosmic alchemist, just as Saint Germain and Jesus are, and is able to precipitate anything that is required—anywhere, for and on behalf of anyone—for the spiritual upliftment, support and joy of lightbearers. Mother Mary speaks to us about life’s holy purpose, our roles as co-creators with God, the importance of sacred ritual, the science of sound and the law of the I AM, secret-ray teachings, our work with the angels, what it means to hold the immaculate concept, forgiveness, the power of silence and meditation, teachings on healing, the indwelling of the Holy Spirit, the importance of family relationships, and teachings on prayer and fasting. In offering the rosary, Mother Mary has taught us that we are invoking the Mother-God in all life, the Mother Ray, the “Ma-Ray.” Yes, Mother Mary is the example of the Feminine aspect of God, the Mother Principle, the Cosmic Virgin, the Woman Clothed with the Sun spoken of in Revelation. And she wants each of us to be that also. The rosary anchors the light of the Mother Flame within the earth and within the souls of her chelas. 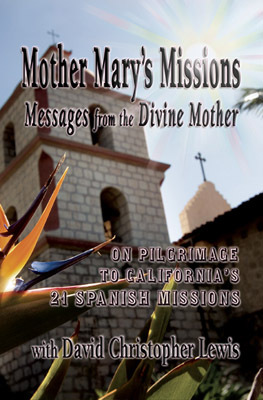 For as we honor the Mother Flame in Mary, we also honor that flame within ourselves. And as we revere the light within the one, the Mother of Jesus, she—reflecting back to us that same love and reverence—raises our awareness of self in that Mother Light to the crown. Those who are sensitive as they pray will feel the coursing of this Mother energy known as the kundalini from the base to the crown, nourishing their chakras. It is a washing action of the light; it is a daily cleanse, a bath of divine radiance. It is the Mother’s nurturing of us as we revere her love, her light and all that she did for Jesus but also for us.